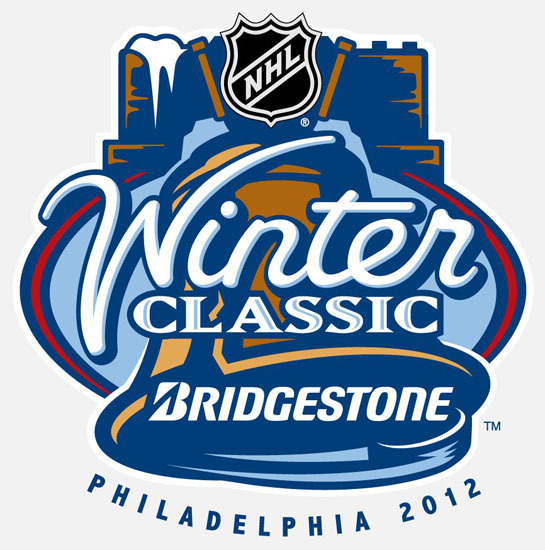 We are just days away from 2012 and the Icers' return to action under the bright lights at Citizens Bank Park. Before heading off to visit my family over Christmas, I got together with senior Paul Daley to get his perspective on playing outdoors, and added reminiscences of JoeBa and yours truly about our experiences on frozen ponds. I also got in touch with Dr. Larry Hendry, the first coach of the Icers, and asked him to provide a few words on playing "au naturel" back in the day. Dr. Larry provided more than a few words. He found the time during a hectic Christmas that, as he put it, was "a challenge with three of the grandkids at 20 months to 3 years old. Our garbage disposal and dishwasher went out making for more fun. All in all, I wouldn't have it any other way." Larry, on behalf of all of us in the Icers family, thank you so much, not only for what you have so eqolquently written, but for what you and the Icers pioneers did to set the stage for what we enjoy today. Happy New Year everyone, we'll see you in Philly! In the fall of 1971, some 200 ice hockey enthusiasts joined the Penn State Hockey Club and gathered together to play for the first time on campus since the early 1940’s. Most players had grown up skating outdoors on frozen ponds, lakes and rivers, given that indoor rinks were relatively scarce in North America. The opportunity to play for the first time at Penn State on artificial ice was a dream come true when the University renovated a field house that was also shared with the track and baseball teams. Historically, numerous valiant efforts that had been made to establish hockey as a sport - including flooding the campus tennis courts - failed largely due to variable weather conditions. The composition of the club was eclectic as undergraduates, grad students, staff and faculty were all welcome to participate. The club was organized such that there were multiple intramural teams and “A” (aka varsity) and “B” (aka junior varsity) squads. Although few knew each other, a strong bond quickly formed between club members as they shared stories about their formative years on the ice. Everyone pitched in at every level from all night ice painting (five times during the season) to collecting dues and donations at a time when the club had virtually no resources. A high level of academic excellence was evident as students practiced in the evening with internationally known Professors who had lectured them earlier in the day. One line was composed of a freshman engineering student at center flanked by a Ph.D. student in Earth and Mineral sciences at right wing and a Professor of Chemistry at left wing. While many of the players were from Pennsylvania, where ice hockey was struggling to gain acceptance, some veterans turned mentors were from rabid hockey bastions in Minnesota, Massachusetts and upstate New York. A half dozen very talented Canadians from Montreal, Calgary and Toronto shared experiences of playing pick up hockey at an early age from sun up to after sunset. Some Penn State players actually played Division I hockey (St. Lawrence, University of Alberta, McGill University) and others had played on Junior A or semi-professional teams. Thus, contrary to what one might expect, the inaugural and subsequent Penn State teams were far from a “rag tag” group and presented themselves well. My personal experience at skating was in one of the most unlikely of locations, namely, a pond adjacent to a boathouse in New York’s Central Park. When my brother and I were able to stand up on skates, my father, who was attending night school under the GI bill, would take us to the park on weekends. He would help put on our skates and then hit the books while watching over us from a patio overlooking the pond. Negotiating the rocks and stones along the shoreline to get to open ice was always a challenge as well as trying to keep skate blades from being caught in crevasses that pervaded certain sections of the pond. Once warmed up, the sometimes-bitter cold was forgotten and the wonderful feeling of skating freely over the long expanses of the pond took over. When it was nearing time to return home, my father would lace up his racing skates and fly around the pond backwards while pulling us at terrifying speeds. It would be some years later that we found out that our dad had won several medals in speed skating events at Madison Square Garden while serving in the Army. After completing graduate school in the winter of 1971, I joined the Penn State faculty. To my surprise and disappointment, hockey had not been played on campus for thirty years. Thanks to the efforts of many, hockey magically burgeoned at Penn State in the fall of 1971 and has remained in continuous operation for forty years. The first team in 1971-1972 sported a won-lost record of 14-6. While all practices were indoors and only one game was played on outdoor artificial surface, many of the veterans told stories of their humble beginnings shoveling snow for hours just to be able to clear a surface to skate. We often talked about our collective dream of having a Division 1 hockey team in Happy Valley. Today, we old-timers who are scattered far and wide across the continental US, Hawaii and Canada remain in contact and still reminisce about the “Miracle of ‘71”. Those of us who only played sparingly in our youth in front of a few fans (mostly family) remember vividly taking to the ice at the first game at the Ice Pavilion to a standing room only, packed house of thousands with many more fans in the parking lot trying to get in the door. It goes without saying that we look forward to the fulfillment of the dream of D-1 hockey at Penn State along with the past 40 years of players, fans, coaches, volunteers and supporters. Those of us from the early 70’s who can’t make it will also be there in spirit as the team takes to the ice in the ground breaking outdoor game January 4 at Citizens Bank Park in Philadelphia against the Neumann Knights. It's Beginning to Look a Lot Like...Hockey! I've been a very good boy this year, so I'm hoping that you will bring me just one gift for Christmas. Would it be too much to ask for some cold weather in Philadelphia the first week of January? Let's face it, the weather is always a crapshoot when it comes to playing hockey outside. And while it's too early to accurately forecast what awaits for the Icers and Neumann Knights as well as the Rangers and Flyers, everyone involved with the NHL Winter Classic is hoping there will be cold and maybe even some snow like we saw in Buffalo, Chicago and Boston, and not the rain-soaked affair witnessed in Pittsburgh. If the current seven-day forecast is any indication (and it really isn't), we'd better be extra nice so Santa brings a change in the weather. For those of us north of 40, playing outdoors until we couldn't feel our toes remain one of the fondest memories of our mostly misspent youth. For me, my brother and our friends it was a wealth of opportunities. We enjoyed a small natural pond close to our house on the eastern edge of Toronto, a much larger pond provided when the owner of a nearby nursery flooded the field where his plants grew in the summer, and not one but two natural rinks at our elementary school. Each fall, fathers and sons would construct a hockey rink with plywood sheets as boards and a pleasure skating rink surrounded by 1x10's. Once the cold weather arrived, our dads would haul out the firehose every night and flood the rinks. I swear the ice was smoother and faster than some of the arenas I've been in with the Icers. ...a “community representative” needs to get the principal’s okay and a permit application needs to be filled out. It’s a long-winded process where the Toronto District School Board needs to sign off on it and meetings with city parks staff, janitors and the school board need to be scheduled with the community representative. The whole thing usually takes six to eight weeks and the application must be filed by Aug. 1 each year. Ms. Yuen wrote about the many NHL stars that learned the game on ponds and backyard rinks. I can attest to that having shared the ice at Inglewood Heights PS with Brad Park. The Parks lived around the corner from us for a time, long before Brad became Hockey Hall of Fame member Brad Park. We even played organized hockey under the sky at the Agincourt Lions Arena. I scoured the archives and found this photo from somewhere around 1970. Your humble hockey player is number 6 in red. I can still hear my coach screaming, "Hey Penstone, get two hands on the stick!" Skating outdoors is a throwback to a simpler day with no referees, no coaches and no parents. Just being able to breathe the crisp winter air and work up a sweat while playing the game I love is about as good as it gets. So I am envious of the members of the Icers who will get to experience the ultimate outdoor feeling by playing as a part of the Winter Classic. I'm envious as well, but I'm hoping that we'll be able to call the game down at ice level on a cold night, with our noses running and the feeling leaving our toes. I'm not sure the Executive Producer sees it my way, but it sure would be fun. The fun factor is not lost on senior Paul Daley, but Gunner knows that the Icers will have to take care of business against the Knights. Lastly, Barbara and I would like to wish everyone a very Merry Christmas, a Happy Hanukkah and a safe and Happy New Year. We hope to see many of you in Philadelphia! It is difficult on this Saturday morning to find any positives out of Friday's 4-3 loss to the Liberty Flames. Despite jumping out to a 2-0 first period lead, the Icers were out of synch most of the night, especially in the third period. The turning point to me came at the start of the third, when Penn State was unable to score with a lengthy two-man advantage. Just like in the loss at Delaware, the Icers were guilty of turning the puck over in the grey zones at both blue lines. Too many turnovers led to too many odd-man rushes by the Flames, including the two third period goals that sealed the victory for Liberty. The ugly scene at the end of the game doesn't deserve comment, other than to say that it spoiled what had been an entertaining game, especially for the hometown fans. Here's hoping the Icers rebound this afternoon just as they did against Delaware. As everyone knows now, the Icers will play Neumann U. at Citizens Bank Park in Philadelphia on January 4. Director of Hockey Operations Bill Downey joined me during last night's first intermission. Bill gave an honest assessment of the Icers' first period performance before talking about the outdoor game. The long-awaited news was delivered to us via Twitter this afternoon when Barb and I were about an hour outside of Lynchburg, VA.
Another of the "worst kept secrets" in college hockey became official today - Penn State will play NCAA Div. III Neumann U. as part of the NHL Winter Classic at Citizens Bank Park in Philadelphia. The #1 Icers will meet the 15th-ranked Knights at the home of the Phillies on Wednesday, January 4 at 8:00pm. The contest is part of the Winter Classic week. Tickets are $10 and can be ordered online. Be sure to use PSU as the promo code. Neumann is currently 5-3-0 heading into this weekend's series with Morrisville. The Icers are 13-1-0 as they ready for a tough weekend series against the Liberty Flames. Ironically, the Knights and the Flames rosters are filled with foreign talent. Both squads are loaded with Canadians and each team has a player from Ukraine. The center piece of the Winter Classic week is the meeting of the Flyers and Rangers on January 2. The Flyers and Rangers alumni will "battle" on New Years Eve day, and the third-ever AHL outdoor game, featuring the Adirondack Phantoms and Hershey Bears, will take place on January 6. Thanks to the dedication of Comcast-Spectacor President Peter Luukko for spearheading the effort that will see us in Philly in the new year. As Penn State becomes a Division I Hockey school, what better way to make a statement than to compete on the largest stage in the State of Pennsylvania when they face off against Neumann University at Citizens Bank Park. There are a tremendous number of Penn State alumni living in the Greater Philadelphia Region who are looking forward to this game. We are thrilled to host this game as part of a week-long celebration of hockey in Philadelphia. It will be great for the City and great for the school. We’re really looking forward to welcoming Penn State Division I hockey to Philadelphia. Coach Guy Gadowsky knows a little about playing outdoors, and what this will mean to the team. Many of my fondest memories of growing up playing hockey come from playing outdoors. There is something really special about the feel of the air and the sound of the ice. The Penn State hockey family is extremely grateful to Comcast-Spectacor President Peter Luukko for the opportunity to participate in this once-in-a-lifetime event. It will be an unforgettable experience for our entire team. I know that I have great memories of playing on frozen ponds and the outdoor rinks in suburban Toronto. Guy hails from Edmonton - we can only hope it's not quite as cold in Philly as it gets in northern Alberta! Bill Downey gets credit for his behind-the-scenes work, along with former teammate and Wells Fargo Center assistant manager Joe Sheridan. Billy is expected to join me during Friday's first intermission to talk about the plans. Here's a look at the initial preparations for putting down the ice surface at CBP. Picture yourself sitting in the stands watching the Icers. Meanwhile, I'll try to picture where the Executive Producer and I will be. The laughing is over after the weekend romps over Rutgers. The Icers were all business at today's practice as they began to get ready for the final weekend of action in the first semester. Guy Gadowsky will take the team south of the Mason-Dixon Line to take on the eighth-ranked Liberty Flames on Friday and Saturday. Head coach Kirk Handy has guided the Flames to the ACHA National Tournament seven times, including a second place national finish in 2006, since taking over as the bench boss in 2000. The Ontario native recruits heavily north of the border, with 13 Canadians on this year's roster. As I always say, they may attend a Christian school, but the Flames don't turn the other cheek on the ice. It's a given that any team that plays Liberty can expect a tough, physical battle for sixty minutes. The Flames are 13-5-1-2 on the season, including a 4-3 shootout loss to Arizona State at the Showcase, a 3-2 loss at Oklahoma and a pair of wins at Central Oklahoma. The "seventh man" at the LaHaye Ice Center has helped the Flames to a 9-4-0-1 record, with Liberty outscoring the opposition 76-40. It's safe to say that the student body likes to vent some steam at Liberty games. They are as raucous as Gang Green at the Bird Arena. I caught up with Coach Guy after today's practice, and also chatted with Tim Carr. Tim notched his second win and first shutout in Saturday's 9-0 win over the Scarlet Knights. It was good to see Taylor Holstrom in full gear. Taylor has been cleared to practice with no contact. He told me afterwards that he hopes to be ready to return to the lineup in January. I'd be remiss as a broadcaster if I didn't tip my cap to the Liberty video crew for their outstanding productions. Take a look at the highlight packages produced by their student broadcasters. Excellent work! With no disrespect to Rutgers coach Andy Gojdycz, his team and Rutgers fans, this weekend's games with the Scarlet Knights were a foregone conclusion by about 7:15 on Friday night. Dan Meisleman's power play goal at 2:32 of the first period on Friday opened the floodgates as the Icers scored 22 times in the 13-2 and 9-0 victories. The Scarlet Knights simply had no answer for the speed and depth of the Icers. As Guy Gadowsky told me in Saturday's pregame interview, the games were not about padding the stats. He thought the Icers owned neutral territory on Friday. They did an even better job on Saturday. Coach Guy highlighted the strong play of Nate Jensen and Michael Longo on Friday. The buzz phrase of the day in hockey is "playing a 200-foot game." The line of Longo, Mike McDonagh and Tim Acker owned the ice every time they were out there. The first couple weeks back were tough to fight through. I took the brace off recently and it's been feeling a lot better. Perhaps the only blemish on the weekend was the short-handed goal by Matt McDonald, who is far and away the best player on the Rutgers roster and is also one of the best in Division 1. Ironically, McDonald also scored a shorty against the Icers in last season's finale. Saturday's second period was less than a thing of beauty, with lots of whistles and sloppy play. Perhaps that was a factor of Friday's result and the one-sided play in the first period. However, the Icers got over the lethargy in the final twenty minutes to put a bookend on the strong play in the first twenty. The Icers will wrap up the first semester next weekend, with a tough road trip to Liberty University and the eight-ranked Flames. Kirk Handy's team has not played since taking two from Central Oklahoma in Edmond on November 18-19. The Flames will tune up for the Icers by hosting Div. II Virginia Tech on Monday night. With no games for the Icers this weekend, this is a chance for me on this day before Thanksgiving to look back at last weekend's home-and-home series with Delaware. Friday's 4-3 loss at the Rust Arena was frustrating for the team, frustrating for Barb and I -- and certainly frustrating for you the fans. The technical gremlins that popped up again exacerbated the night as the team tried but was unable to maintain its unbeaten streak. Saturday proved that the sun will come up again, as the guys wrapped up the lengthy rivalry with Delaware (barring a tournament showdown in March) with a solid 5-1 victory. Barb put it best from our viewpoint when she said "It's much nicer being at home", which allowed us to give everyone a flawless broadcast. The highlight of my weekend (other than the problem-free Saturday) was the chance to talk with two guys who have been a part of most of the 101 meetings between the Icers and Blue Hens. Former Icers John O'Connor and Josh Brandwene have been on both sides of the fence, giving each of them a unique perspective on what has made the rivalry so great. Of course, Josh is back in the fold as the coach of the Lady Icers and the man entrusted with building the varsity program to a national championship contender. Now, if we could only get Jocko back onto our side of the fence! Barb and I would like to wish you a safe and happy Thanksgiving. We will be spending a quiet day at home, but our thoughts will be with our families, our friends and co-workers, and all of you in the Icers family. We have said it so many times, but it bears repeating ---- we value your friendship above all. May your table be bountiful, but I hope that it doesn't include this "delicacy" delivered via email by JoeBa on Thanksgiving 2009. Iron City, Isaly's chipped ham, and pierogi. Pass the Pepto Bismol, please! That was the sentiment as Icers fans filed out of the Greenberg Ice Pavilion following Saturday's bounce-back performance by the Icers. The 5-1 victory over #2 Delaware erased the bad taste of Friday's 4-3 defeat by the Blue Hens at the Rust Arena. With the win, the Icers head into the Thanksgiving break at 11-1. Delaware lost in regulation time for the first time this season. The Blue Hens' record is now 15-1-1. The Icers were motivated after getting outplayed on the Olympic ice surface in Newark. Kurt Collins' post-game comment said it best. It stinks to lose, but you learn a lot and sometimes it takes a loss to wake you up. The Icers dominated despite a slow start, outshooting the Blue Hens 47-25. P.J. Musico was solid in goal, recording his fifth win of the season. S.J. Broadt was equally solid in the Delaware net, despite giving up five goals. Broadt made several sensational saves, including the highway robbery of Justin Kirchhevel in the first period that had the crowd on its feet, your humble game-caller screaming GOAL and Rodney Martin firing up the goal horn and Zombie Nation (albeit briefly). As for the pucks that DID find the back of the net, freshman Tim Acker notched his first two as an Icer, Mike McDonagh recorded his second power play goal of the season, while Bryce Johnson and George Saad rounded out the scoring. Whether or not the 101st meeting between the Icers and Fightin' Blue Hens turns out to be the final time they meet, it will be remembered as a classic. It was a battle between two well-coached and well-disciplined squads. The game featured everything you want to see and none of what you don't want to see. There was the aforementioned goaltending, fast skating, quick passing, great end-to-end action, solid body checking.....and virtually no post-whistle scrums. The couple of gatherings that did occur quickly dissipated with none of the usual stuff that we see all too often in ACHA games. I think that it's safe to say that the fans of both teams hope to see a rematch in Cleveland on March 7, 2012. Right off the top, let's put aside all the hype about a potential national championship game preview. I know I brought it up, but I also said there is a lot of hockey to be played before the national tournament. Having said that, this weekend's home and home series between the Icers and the Delaware Blue Hens is going to be a classic. It is a shame that these two rivals will only meet twice in this final season in the long history between the two programs. Earlier in the season, I rated the Icers - Ohio rivalry as the best in ACHA history. I'd have to rank the Icers and Hens right up there as well. These games will be the 100th and 101st between the two programs. Since 1990, the two teams have met 71 times in regular season and tournament action. While the Icers have dominated the series with a record of 80-16-3-0, the Hens in the past few seasons have given the Icers more than they can handle. Since the 2007-08 season the record stands at 12-7 for the Icers, including two ESCHL conference championship victories (2008 and 2009) and last season's conference semi-final loss. The teams went 2-2 in the regular season in 2010-11, with splits in each team's barn. The Hens have won eleven straight, and their only loss was a 4-3 overtime decision against Arizona State a the ACHA Showcase. Last weekend, they traveled to Lynchburg, VA and took two from Liberty by scores of 3-0 and 4-2. Delaware is a veteran and well balanced team. Head coach M. F. Schurman has eight players with double-digits in points, led by monster sophomore Christian Tasker. The 6'2" 225-pound Tasker has 8 goals and 11 assists in 14 games, and can be an immovable object in front of the opponent's net. At the other end, junior S. J. Broadt has seen the bulk of the action between the pipes for Delaware. He is 11-1 with a 1.97 goals against average and a 93% save percentage. As I said earlier, this weekend should be a dandy, and a real palate cleanser after last Friday's ugliness. On Monday I talked with Mike McDonagh, Brandon Russo and Coach Guy. Some of Mike's comments were drowned out by the guys as they headed to the locker room. It wasn't pretty, but the Penn State Icers maintained their unbeaten record (10-0) with Friday's 7-0 whitewash of the West Chester Golden Rams. Unfortunately, this one deteriorated into an old-style, penalty filled ACHA game. It's been a few years since the penalty side of my scorebook came close to being filled. After just three minors called in the first period, it went steadily downhill in the final forty minutes. A total of twenty-two penalties were called in the final two periods. The Icers went 4 for 9 on the power play, while holding West Chester off the board in their three power play opportunities. To top it off, Mike McDonagh scored a highlight reel short-handed goal. Brandon Russo made his first appearance as an Icer and made quite an impression. Russo sprang Taylor Holstrom on a breakaway for his sixth of the season to make it 2-0. Brandon made it 6-0 in the third with a blast from just inside the blue line. With West Chester in the rear view mirror, the Icers now have to focus on this weekend's home-and-home series with the fourth-ranked Delaware Blue Hens (14-1). M. F. Schurman's team has won eleven in a row since dropping a 4-3 decision to Arizona State at the ACHA Showcase on October 8. A new ranking will be released on Friday, so it's not inconceivable that by the time the puck is dropped at the Rust Arena this could be a series between the top two teams in the ACHA. There are some out there that think this weekend could be a preview of the national championship game. That may be a possibility, but there is a lot of hockey to be played between now and March. The Penn State Icers enjoyed a well deserved day off on Monday after winning both weekend games with a come-from-behind 5-4 victory over NCAA D-III Fredonia State on Saturday night and a 5-1 decision over Pitt on Sunday afternoon. However, there's no resting on their laurels for the undefeated and top-ranked Icers. They will host West Chester on Friday night in their only game this weekend. The Golden Rams make their final visit to Hockey Valley fresh off a sweep of the injury-riddled Rhode Island Rams. The #23 Golden Rams improved their record to 9 wins and 3 losses by fleecing the 13th-ranked Rams 3-2 and 3-1. It's the first time West Chester has swept Rhody at the Ice Line since October of 2008. That season, both West Chester and Penn State were eliminated in the semifinals of the National Tournament at the Gilmour Academy in Gates Mills, Ohio. As reported in the West Chester student paper, Steve Meade scored his team-leading 11th goal in the Friday win, while senior captain Tom Scocozza scored both nights, just his second and third of the season. They very well may be the best ACHA team ever. If we're going to play with them, we have to play hard and smart and stick to the game plan. That game plan will include clogging up the shooting lanes and trying to frustrate the Icers with some physical play, especially away from the puck. I spoke with freshman Jake Friedman and Coach Guy following Tuesday's practice. During the Illinois weekend, I said Jake was "snakebit" after several missed scoring opportunities. Since the games on the Big Pond he's put three in the net, including the big second period tally on Saturday that keyed the three-goal comeback against Fredonia State. Jake also chipped in a with assists on Bryce Johnson's two first period goals on Sunday, giving him 8 points on the season. This past weekend had the potential to be a difficult weekend for the Icers. The opponents in the rare Saturday - Sunday games could have derailed the winning streak - for two different reasons. On Saturday, the Icers faced what could be their toughest opponent of the fall semester in NCAA Div. III Fredonia State. On Sunday, they could have faced one of those so-called "trap" games against the Pitt Panthers. Saturday's battle against the Blue Devils was just that - a battle. The Icers rallied from a two goal deficit, scoring three straight to win by a 5-4 margin. Justin Kirchhevel led the way with a pair of goals, while Jake Friedman, Steve Edgeworth and George Saad brought the Icers the victory. Matt Madrazo overcame a shaky start and was outstanding in the final period. Matt stopped 28 shots to record his fourth win in four starts. Bryce Johnson on Sunday matched Kirchhevel's performance with two first period goals as the Icers avoided an emotional letdown against the Panthers. Kurt Collins, Dom Morrone and Forrest Dell added singles as the Icers outshot Pitt 55-17 enroute to a 5-1 victory. P. J. Musico picked up the win, but was denied his shutout bid when Brandon Pratt scored at 8:12 of the third period. Dell had a strong weekend, playing Saturday alongside Brian Dolan on the blue line and then moving on Sunday to center a line with Dan Meiselman and Michael Longo. Next up for the Icers is the West Chester Golden Rams, Friday night at 7pm. West Chester makes its final visit to Hockey Valley fresh off a sweep of the injury-riddled Rhode Island Rams. The highlight video from Saturday omits the first period goals due to a corrupt recording file. As Rodney Martin put it - better late than never! This weekend's Friday - Saturday game schedule for the Icers has given me the chance to hit the road once again. This time, it's Columbus, Ohio and tonight's game between my Toronto Maple Leafs and the Columbus Blue Jackets. Icers dad Greg Kirstein was kind to arrange media credentials that gave me the opportunity to attend the morning skates for both clubs. Most of the Leafs skipped the morning session after Wednesday night's wild 5-3 win in New Jersey. However, I was able to speak with rookie and former Wisconsin Badger Jake Gardiner. Jake talked about Penn State, the Big Ten Conference, what fans can expect when the Nittany Lions play at Wisconsin, and his high school playing days with Nate Jensen. Pittsburgh native R.J. Umberger and former RPI goalie Allen York were in the Blue Jackets locker room. R.J. talked about how Penn State will influence the growth of hockey in Pennsylvania and Ohio, while York talked about the big school/small school issue as well as his path from his home in Alberta to college hockey in Troy, NY. Allen's comment about being able to mature physically while at RPI matches what Ryan Miller said to me when I spoke with him in Buffalo on the day that Terry Pegula was introduced as the new owner of the Sabres. In what can best be called a "target rich environment", I was able to get additional comments from a couple of hockey experts. Former NHLer, Notre Dame player and coach and current Leafs VP of Hockey Operations Dave Poulin and Blue Jackets TV analyst, Ohio State player and Miami of Ohio head coach Bill Davidge also gave me a few minutes and their thoughts on Penn State joining the varsity and what it means to the future of college hockey. A long weekend for most people is welcome. For the Penn State Icers - not so much. The team enjoyed a successful weekend on the ice, sweeping a pair of games in their last trip to the Boss Arena at the University of Rhode Island. Then Mother Nature turned a 7-hour bus ride into a nearly 24-hour marathon. First to the positives - a 6-2 victory on Friday, followed by a 4-2 nailbiter on Saturday. As Coach Guy says, he's more satisfied with Saturday's play than what he saw on Friday night. I was impressed by the penalty killing both nights. The team gave up one power play goal on a dozen chances. That included a perfect 7-for-7 on Saturday, when the Icers had to deal with a pair of two-man advantages for the Rams, along with Nate Jensen's 5-minute major for a check from behind. Chris Cerutti returned to the lineup, and notched his first goal of the season and the game-winner on Friday with a power-play marker in the 2nd period. After skating as the extra forward on Friday, Chris slid into Tommy Olcyzk's spot on Saturday and did not look out of place alongside Taylor Holstrom and Justin Kirchhevel. The wins were the upside of the weekend - the bus ride home surely was the downside - right into the teeth of the wicked Nor'easter that pounded New England and much of eastern and central Pennsylvania. The combination of impassable roads and mechanical problems meant that the guys didn't get back to State College until late on Sunday afternoon. By all accounts, everyone tried to make lemonade out of lemons. Having said that, Barb and I were thankful we weren't with them! With another road trip in the book the Icers are preparing for what might be their toughest test of the first semester. The Fredonia State Blue Devils, a perennial NCAA Div. III powerhouse, will be at the Greenberg Ice Pavilion on Saturday night. Head coach Jeff Meredith, in his 24th year at the helm, brings a big, veteran team to Hockey Valley. Last season, the Blue Devils advanced to the SUNYAC championship game. Game time Saturday is 7:00pm. The Icers will wrap up the weekend with a rare Sunday matinee as the Pitt Panthers come in for a 1:00pm faceoff. For the second week in a row the Penn State Icers' opponent rebounded from a Friday shellacking to give the Icers a much tougher test on Saturday. Just like the Fighting Illini the week prior, the Ohio Bobcats fell behind early on Friday as Eric Steinour scored just 17 seconds after the opening faceoff as the Icers cruised to a 7-1 victory. On Saturday, Bobcats coach Dan Morris adjusted his game plan and for the first time this season the Icers fell behind the opposition. Brett Agnew's first period power play goal and stifling defensive zone play kept OU on top until the 2:47 mark of the third period. That's when Kurt Collins went to work. Collins scored short-handed to tie it up, opening the door as the Icers rallied to win 5-3. Kurt added a power-play goal and another shortie with OU goalie Fedor Dushkin on the bench for the extra attacker, while Steven Edgeworth and Tommy Olczyk chipped in with singles. It was a great weekend for the line of Collins (3 goals & 3 assists), Steinour (2 goals & 2 assists) and George Saad (1 goal & 2 assists). This weekend, the Icers make their final visit to the Brad Boss Arena in South Kingston, Rhode Island. The tenth-ranked URI Rams return home after being swept by #5 Delaware, the first back-to-back losses for the Rams in 45 games. Just like Dan Morris, URI coach Joe Augustine has an injury-riddled roster. Only nine of his players have played all ten games and Augustine was forced to dress nine freshmen in Friday's loss at the Rust Arena. Freshman Tim Carr will get his first start in goal for the Icers in Friday's game, with Matt Madrazo scheduled to start on Saturday. Speaking of coach Mo - Dan was kind enough to drop by during the first intermission of Saturday's game to talk about the OU-Icers rivalry from the Ohio perspective. We also talked about the friendships that have developed despite the fierce on-ice battles. While I might not miss climbing up the scaffolding at the Bird Arena, I will miss those friendships in the upcoming years. And with that, the end of varsity hockey in the Deep South. Last month, I wrote about the grassroots effort to save the University of Alabama-Huntsville hockey program in the face of looming budget cuts across the UA system. Despite the best efforts of the Save the Chargers group and local officials and business owners in Huntsville, Interim Chancellor Malcolm Portera today killed the only Division 1 hockey program south of the Mason-Dixon Line. My thin involvement with the Chargers came in March of 2007, when I called the game for Notre Dame as UAH took the #2 Irish to double overtime in the NCAA Regional in Grand Rapids, Michigan. I saw the passion in the players and the passion in the Chargers fans. As few as they were, they were the seventh man for their beloved Chargers that night. That passion came to the fore in the past few months as they tried to keep the program alive. Sadly, Dr. Portera would have none of it and just like that, the Chargers will join the likes of Wayne State, Findlay, Iona and Fairfield on the scrap heap of college hockey programs. I am truly sad for the UAH faithful and truly disgusted with how this has happened. There are dozens upon dozens of blog posts and forum threads expressing the same sentiments. Nashville Predators' blogger Paul McCann does not mask his contempt for Portera. ...rest assured, there is one person to blame for this, and that is Interim Chancellor Malcom Portera. Dr. Portera ignored the commitments to fund the program, he ignored the commitments to market the program, he ignored the community support that was overwhelming in its determination to maintain UAH Hockey as a Division I sport. He carried through with the agenda he brought into the position when he came to work in Huntsville earlier this year. A new Chancellor takes over at the end of this week. As of Friday, Dr. Portera can slink back off to whatever part of Alabama he came from and pass off a university that, quite frankly, is worse than when he found it… a thirty year tradition of hockey gone with the stroke of a pen. Congratulations Doctor… I hope you are happy with the decision you made, I hope you are pleased you negatively impacted the lives of these fine student athletes. I hope you can rest well knowing that you ripped out a big piece of not just the UAH community, but the entire Huntsville area with one uninformed and ill-reasoned decision. The final visit of the Ohio Bobcats to the Greenberg Ice Pavilion turned out to be as expected, and almost a carbon copy of the Icers' previous weekend's results at Illinois. On Friday night, the Icers cruised to a 7-1 victory. However, the Bobcats used a stifling defensive scheme on Saturday, frustrating the Icers for 40 minutes before giving up five third period goals as the Icers kept the unbeaten streak going with a 5-3 decision. This was a weekend for the grinders, especially the line of Eric Steinour, George Saad and Kurt Collins. Steinour and Jake Freidman led the way on Friday, each netting two goals. Jake's both came on the power play, and a week after he was snake-bitten in Illinois. It was Kurt Collins' turn on Saturday, as the senior from State College recorded the hat trick with two short-handed goals sandwiched around a power play tally - all coming in a wild third period after the Icers trailed 1-0 at the end of 40 minutes. Steven Edgeworth recorded his second goal on Saturday, while Tim Acker and even P.J. Musico recorded their first assists. Acker and Dan Meiselman both made their first starts in the blue and white, and both played well. Forrest Dell was moved back to the blue line on Saturday after scoring Friday as a forward. I thought that he made a great defensive play on Brett Agnew with 59 seconds left, and must admit that I did not see referee Ryan Monahan call for the penalty shot that Agnew converted - following the scrum that got more than a little ugly. All of the fun and games of the typical OU-Penn State weekend, performed in front of many of the parents of the players. Even my parents were on hand to enjoy the games and the player-parent dinner on Saturday night. It was great to meet the new members of the Icers family. We hope we'll see you several times throughout the season ahead. The Icers didn't look any worse for wear at Monday's practice. Ah, the benefit of being young! A little over 24 hours after a long overnight bus ride and they were right back at it on the ice. The team headed home following Saturday's 5-2 victory over Illinois, giving Penn State a weekend sweep and a 3-0 record on the season. Illinois played a much better game in the finale after getting shellacked 11-0 on Friday night. Both games highlighted the Icers' outstanding play in the defensive zone and a transition game that is built around team speed. The line of Justin Kirchhevel, Taylor Holstrom and Tommy Olczyk continued their torrid start to the season, accounting for nine of the 16 goals scored in the two games. Matt Madrazo and P.J. Musico split the weekend. P.J. stopped 18 shots to record his first Icers 'W' on Saturday, while Matt notched his 3rd career shutout by stopping all 19 shots on Friday night. Yep, it was fun chatting with Big Ted on Saturday and Eddie Olczyk on Friday night. And you thought Edzo would be a tough act to follow. The fun is over for the team, because this weekend they face what could be their toughest test of the season. Dan Morris brings his third-ranked Ohio Bobcats to the Greenberg for the final time as an ACHA foe. The rivalry is epic - two teams that have a grudging respect tempered by a good hate that has developed over the decades. Expect that the 'Berg will be packed and loud! The Bobcats are 5-1 overall, with 3 wins over West Virginia and victories over Oklahoma and Pitt and a loss to Delaware. Matt Madrazo knows what the atmosphere will be like this weekend. I spoke after practice with Matt and Coach Guy. Just time for a quick post before Barb and I hit the road for the long trip back following the Icers' sweep of the Illini. The 5-2 victory featured more solid play by the team; however, as JoeBa said in the post game interview, there's still work to be done. Credit the Illini and goalie Nick Clarke for a much better effort Saturday night, rebounding from Friday's 11-0 whitewash. Speaking of goalies, it was great to see Ted Hume on Saturday. As always, Big Ted was not at a loss for words. Ted is a man who enjoys life while marching to the beat of his own drummer. Then again, it's said that most goalies are a unique breed! So, it's farewell to the Big Pond for the last time. Bring on the Bobcats. No matter who I talked to last night, from JoeBa to Coach Guy to some of the parents, including Ed Olczyk, no one expected that the Icers would lay an 11-0 beating on the Fighting Illini at their own barn. The first period certainly didn't give an indication that the score would be so lopsided. Illinois came out and challenged the Icers through the first half of the frame, testing Matt Madrazo early on. At the other end, Illini goalie Nick Clarke thwarted the Icers until Tommy Olczyk opened the scoring by converting a nifty drop pass from Justin Kirchhevel at 8:32. Taylor Holstrom made it 2-0 with 2:10 left in the period, with Kirchhevel and Olczyk picking up the assists. The trio poured it on in the second period as the Icers scored 6 more,including a Dan Loucks power play goal, to lead 8-0 after 40 minutes. That would be the night for Kirchhevel, Holstrom and Olczyk as Coach Guy sat them for the final 20 minutes. However, the Icers added 3 more - Mike McDonagh on the power play, Paul Daley and Eric Steinour - to make it 11-0. So, through their first 100 minutes in Penn State blue and white, Justin, Tommy O and Taylor have combined for 9 goals and 16 assists (Kirchhevel: 2-9=11, Olczyk: 4-4=8, Holstrom: 3-3=6). It's just two games into the season, so is it too early to give the line a moniker? My old partner John Mulhern thinks they need one. He challenged the fans to come up with something that will top the "BUZZ Line" of Brandon Rubeo, Jaime Zimmel and Paul Zodtner. I'll take credit for coming up with that one. Hmm, If Justin's name was Nate or Norm we could have the TNT line. If you've got an idea, email me at icersman@yahoo.com. Here's the first seven goals from Friday night, along with my interview with proud hockey dad Eddie Olczyk. Forgive the poor lighting and video quality, but that is Eddie with your humble reporter. Edzo had the night off from his many TV duties and brought the whole O-clan down from Chicago. It was very gracious of him to stop by our "booth" for a chat. Barb mentioned that during the first two periods, Eddie was like any other hockey dad, standing at the top of the balcony intently watching his son perform. Just another example of what makes hockey families in general, and the Icers family to be specific, so special. EDIT: Just wanted to take the opportunity to thank Kyle Rossi for his great live blogging during the game. I think that it is safe to say that the Penn State Icers' season begins in earnest this weekend with a road trip to Champaign, Illinois. I mean no disrespect to the Lebanon Valley College Dutchmen, but let's face it, the outcome of last Friday's season opener at the Greenberg was pretty much a foregone conclusion. This weekend's series against #16 Illinois is the first of three consecutive weekends against some of the ACHA's top teams. Next weekend, Dan Morris brings his third-ranked Ohio Bobcats to Hockey Valley and then it's back on the "Rhode" to face the #10 Rams. As Bryce Johnson and Coach Gadowsky told me on Monday, the team is looking forward to bonding on the bus and playing before a hostile crowd at the Big Pond in Champaign. This is the first time the Icers will be on the campus of the Fighting Illini since the weekend of October 12-13, 2007. It was a battle of the top two teams in the ACHA. The #1 Icers and #2 Illini both sported 4-0 records heading into the weekend. By the time the dust settled late on Saturday night the Illini had swept the weekend and would knock the Icers off the top step. Friday's game was decided by Ricky Gomez's overtime goal, giving Illinois a 5-4 victory. Saturday, the Icers were flat and fell by a 3-1 margin. I'm not sure what to make of head coach Chad Cassell's current squad. The Illini opened the season at home on the last weekend of September facing D-II Michigan State. After blanking the Spartans 4-0 on Friday the tables were turned the next night as the Illini fell 1-0. 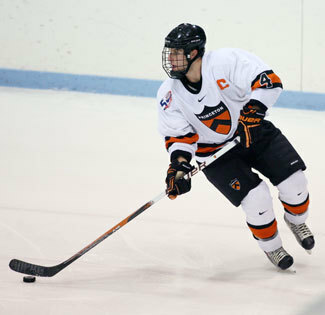 Illinois fared better in last weekend's ACHA Showcase in Springfield, Illinois. After opening with a 2-0 loss to a very good #6 Delaware team, the Illini upset the defending champs #2 Davenport 4-2 before knocking off eleventh-ranked Oakland 5-2. Even though the unusual dimensions and layout of the Big Pond should give the home side a decided advantage, the two teams are dead even at 3-3-1-1 in their contests at the venerable old building. Built in 1931, the arena was designed by the same firm that gave Illinois fans Memorial Stadium and Soldier Field. As you may know, a standard hockey rink is 200 feet by 80 feet. This place really is indoor "pond hockey," because it's (depending on who you talk to) about 200 feet by 115 feet! That extra 35 feet is mostly outside of the faceoff circles. Joe Battista and Scott Balboni both said the key to winning was keeping the play inside of the circles and not getting out to the edges of the ice. I'm sure that Coach Guy will be saying the same this weekend. Guy will have some backup, as JoeBa is making the trip with the guys. When I spoke with him on Monday, I wasn't sure how keen he is about the long bus trip. In addition to the wide ice surface, the seating layout will present a unique challenge. As you can see from the seating map below, the benches sit right underneath the balcony that's occupied by the students. Players and coaches can literally reach up and touch the underside of the balcony. The noise from above can be deafening as well. Barb and I will be up in a corner of the arena. Because the balcony edge is right over the boards, we may have some spots where you won't see the play. Another of the unique broadcast locations we've encountered over the years. Remember, game time is 8:30 in the east. Right off the bat, I'm going to apologize for not getting a post-game report together until today. Frankly, with the whirlwind of getting together the plan to air Icers games on 95.3FM 3WZ and the issues we encountered with the webcast, I was spent after Friday's game. Add two days of work on Saturday and Sunday and today has been the first chance I've had to put 'pen to paper'. All in all, Friday's home opener against Lebanon Valley College went according to the script. The 12-1 romp came against a team that was hampered by a short roster. All but one Icer skater got on the scoresheet as Dutchmen goalie Colin Catherman was blitzed by 64 shots. Matt Madrazo and P.J. Musico had a much easier night than their LVC counterpart, as the Dutchmen could only muster seven shots on goal. Freshman Josh Daley and senior Dan Loucks each scored a pair of goals. I spoke in the pre-game show about the "speed line" of sophomores Justin Kirchhevel and Taylor Holstrom and freshman Tommy Olczyk. They didn't disappoint, combining for 10 points. Holstrom and Olczyk each had a goal and two assists while Kirchhevel chipped in with four helpers. The day off today gave me the opportunity to get to the Greenberg for today's practice, where I caught up with Bryce Johnson and Coach Guy. Both spoke about the excitement of opening night, the appearance of Heisman Trophy winner John Cappelletti, and the upcoming weekend series at the 'Big Pond' at the University of Illinois. The first road trip of the season starts a three-weekend series of games against typically tough opponents. The battle against the Illini will be followed by the Ohio Bobcats' annual trip to the Greenberg and then it's back on the road to Rhode Island to close out October. Lastly, a belated Happy Thanksgiving to Coach and his family, my family and all my Canadian friends and Happy Columbus Day to Barb's family and our U.S. friends. The final Icers Blue - White game is in the history book, so now it's on to the real season. Friday's home opener against Lebanon Valley College marks the beginning of the 41st and final season of Icers hockey (unless the varsity maintains the moniker). The Blue squad, coached by former Icer Rick O'Brien, rallied from a 3-1 first period deficit and scored four in the second to win the contest 5-3. I dropped by practice this afternoon and caught up with the game's first star, sophomore Justin Kirchhevel. Before we began, I got a hint of how the team is coming together. I won't say who, but one of the freshmen came out into the corridor and started chirping at Justin, all in good fun. Don't forget that Friday's game will get underway at 7:00pm. We'll be online around 6:45pm, so we hope that you'll be able to join us. Here's the video, minus the chirping. Wouldn't you know that You Tube put us behind bars! I spent part of a rainy Saturday in Happy Valley mulling over whether or not I should post this blog entry. I have decided to write this not as the play-by-play announcer for the Icers, but as a fan of the game that I have loved and played for more than fifty years. By now, you may have heard about the incident in Friday night's NHL pre-season game between the Edmonton Oilers and Minnesota Wild involving Oilers rookie Taylor Fedun and the Wild's Eric Nystrom. The pair were racing for the puck on a potential icing call. The video shows Nystrom trying to reach for the puck to negate the icing and his stick appears to get tangled in Fedun's skate. As a result, Fedun crashed into the end boards, shattering the femur in his right leg. The sickening incident involves two former NCAA players. The Edmonton-born Fedun played four outstanding seasons under Guy Gadowsky's tutelage at Princeton, and appeared to have a good chance of sticking with the Oilers. More importantly perhaps, Taylor was an 'A' student studying mechanical and aerospace engineering. Nystrom was captain of the Michigan Wolverines in his senior season in 2004-05. Drafted 10th overall by Calgary in the 2002 NHL Draft, he plays a gritty, hard-nosed style of hockey just like his dad Bob did during his career with the New York Islanders. ..no matter how many times I say sorry, he'll still be in the spot that he is. It doesn't feel good to know that you're involved in something that hurt someone so seriously. But he really appreciated me stopping by, and I really appreciated him being so understanding. The social media world erupted - especially Twitter - forcing Nystrom to defend himself against those trying to crucify him in the online world. By most reports Nystrom will not be suspended by the NHL, which would be the right decision. However, the bottom line is that this entire incident could possibly have never happened if the NHL had previously instituted a no-touch icing rule. I will admit right now that when the NCAA and ACHA adopted the hybrid icing rule I was not convinced that it was the right thing to do. I've seen the error of my thinking and now wholly support the rule. Why those in charge of the NHL don't see it that way is beyond me. Fedun's career-threatening injury has reignited the debate. One of the most vocal proponents of the no-touch icing rule has been Don Cherry. "Grapes" has been railing against the current rule for years on his "Coach's Corner" segment on Hockey Night in Canada. Ironically, this segment from March, 2008 has Cherry upset about a similar injury suffered by then-Wild defenseman Kurtis Foster. That's sad when the [NHL] won't do anything about it. When somebody gets killed, they'll do something about it. God forbid that it ever comes to that. Friday's Blue - White game at the Greenberg Ice Pavilion provided the fans in attendance and those watching online a mixed bag, both from the players and with our production. There were some flashes of what you'll see as the season progresses, along with some areas that are still a work in progress. The Blue team rallied from a 3-1 first period deficit to skate to a 5-3 victory over Team White. Both squads suffered from short benches, including the Blues' coaching staff. With Guy Gadowsky on a recruiting trip in Alberta, three former Icers players were selected as honorary coaches. However, former player and coach Mark Horgas was absent, leaving Rick O'Brien (Rich's dad) to go one-on-one against Cliff Graziano. The game was played in two 30-minute periods (there's no halves in hockey) with 27 of the minutes in each period played in running time. Josh Daley (Freshman - Pittsburgh, PA) staked the Whites to an early lead with a goalmouth goal, but Tim Acker (Freshman - Apex, NC) knotted the score just over two minutes later when he banged home a rebound at the other end of the ice. Later in the period, Taylor Holstrom (Soph. - Yorba Linda, CA) rifled a wrist shot from the faceoff circle to make it 2-1 Whites. Three Pennsylvania boys combined to give the Whites a 3-1 lead when Eric Steinour (Junior - Carlisle, PA) redirected a nifty pass from George Saad (Junior - Gibsonia, PA). The play began when Dan Loucks (Senior - Collegeville, PA) fed Saad the puck in the Whites' end. George chipped the puck past the Blues defenseman at the White blue line, setting up a 2-on-1 break. After the game Coach O'Brien wouldn't divulge what he told his players during the intermission. Whatever it was worked as the Blues scored four unanswered goals in the second period to secure the victory. Defenseman Nate Jensen (Soph. - Shorewood, Minn.) joined the rush and knocked in a loose puck to narrow the gap to 3-2. Midway through the frame Nick Seravalli (Senior - Ivyland, PA) tied it up with a shot from the slot. Justin Kirchhevel (Soph. Brookings, SD) put the game away for the Blues, scoring a pair of goals in a three minute span. The first came on a rebound, while the second was a nifty wraparound goal that had goalie Matt Madrazo (Soph. Sea Cliff, NY) going the wrong way. On the production side, I updated our video software over the summer and tried out some new settings last night. Unfortunately, that led to the choppy video in the first period. The change of settings during the intermission helped and even let the viewers see the redesigned scoreboard/clock graphic. I appreciate the positive comments about the graphic from at least one of the online viewers. The software update also gives us the option of having a replay module; however, the processor in my laptop apparently isn't fast enough to allow the replay to "record" at a speed that makes it usable. The gremlins even hit PA announcer (and Icers webmaster) Rodney Martin. Someone changed a number of settings on the audio mixer in his "office" between the penalty boxes, resulting in a poor quality audio feed to our side of the ice. We'll get to work during the upcoming week to correct the technical issues before next Friday's season opener against Lebanon Valley College. Finally, thanks to Hockey Operations Director Bill Downey for joining me during the second period and providing his insight into the team and the upcoming season. And congratulations to the Lady Icers, who followed the Icers last night with a 6-1 drubbing of Buffalo in their home opener. Thanks to the research of my good friends Lou Prato and Kyle Rossi, we all know that hockey in Happy Valley has been around for nearly a century. Now we have more proof thanks to Greg Petrick, father of Icers senior Dan Petrick. My Dad took these in 1948 or 49. He was a member of Phi Gam right across from the IST building. It looks like the rink was built in the front yard of the fraternity based on what I can tell from two of the pictures. Not sure of the rink location of the picture with the single skater. These photos bring back memories of playing pond hockey in my younger days. Speaking of pond hockey, the NHL on Monday finally made it official, formally announcing the 2012 NHL Winter Classic will be played at Citizens Bank Ballpark in Philly. I caught up with Hockey Operations Director Bill Downey following Tuesday's practice to talk about the upcoming season, including that January 4th date with D-III Neumann U. that may - or may not - be a part of the Winter Classic festivities. I sense the boys are getting antsy. After more than a month of tryouts and practices, the Icers are ready to hit someone not wearing the lion on their sweater. Unfortunately, they'll have to wait for another week and a half before kicking off the 41st and final season of Icers hockey. The curtain raiser at the Greenberg Ice Pavilion against Lebanon Valley College is set for Friday, October 7 at 7:00pm. Notice the time change for the Friday night game - and get used to it. The move from the traditional 9:05 start is part of the transition to the varsity program. In the meantime, the guys will get the chance to test their skills under game conditions in the annual Blue/White game on Friday night. The team will play two 25 minute periods, with the faceoff scheduled for 6:30pm. The intrasquad game sets the table for the Lady Icers home opener against Buffalo that gets underway at 9:15pm. The coaching staff will be out of town scouting potential future Penn State stars, so Coach Gadowsky has reached out to Icers alums to man the benches. Mark Horgas (player from 1975-77 and head coach in 1979-80) will team up with Rick O'Brien (1978-79) to take on Cliff Graziano (1991-95). Horgas: It was truly an honor to have Coach Gadowsky invite me...I have been very impressed with the entire coaching staff and administration. O'Brien: I had to read the email a couple times to realize that Coach Gadowsky was really asking for assistance. I think it's great that Coach is reaching out to the Icer alumni to have them involved. I personally welcome the opportunity to get on the bench with the guys; I know the returning players and am really looking forward to meeting the new team members. Graziano: I was excited, but most of all I was honored. Penn State has always held a special place in my heart and to still be involved 15+ years after I graduated is awesome. It's nice to see that the new regime of Guy Gadowsky and his staff is keeping the Icer alumni involved. To me it shows not only that he understands the tradition of the hockey program, but of what Penn State is all about. Speaking of Rick O'Brien, he'll be coaching against his son Rich. They are one of only two father and son combos in Icers history (Joe Zitarelli Sr. & Jr. is the other). Rick has plans on shutting Rich down. Rich denies the rumor that he's asked for a no-trade clause, but he's looking forward to the game and the upcoming season. We are less than a week away from the annual Blue - White game on Friday. Seems like an appropriate time for the final installment of my interview with Joe Battista. As I said to Joe, much to his chagrin, this is the 41st season of Icers hockey, and he has been a part of the program for more than half of those years! While Roy Scott, Larry Hendry and others were the ground breakers that brought hockey back to Happy Valley, everyone knows it is JoeBa who has become the face - and the heart and soul - of Penn State hockey. Joe pays tribute to those pioneers as he looks back with emotion on four decades of Icers hockey and the Icers family. Part two of my interview with Joe Battista is here for you. In this segment, Joe talks about the progress toward the eventual ground breaking for the Pegula Ice Arena and the infrastructure surrounding the arena. Don't forget - the annual Blue - White game is next Friday. We'll be online at 6:15 pm from the broadcast booth at the Greenberg Ice Pavilion.